First things first. The first criterion in selecting a pump is to make sure that you have one that produces vacuum in the most effective range for your application. Most evaporative applications in the lab are best served by diaphragm pumps. These can be made of chemical resistant materials and produce enough vacuum to evaporate nearly every lab solvent (except DMSO) at room temperature. With the addition of modest heat, even DMSO is manageable. In contrast, lyophilization (freeze drying) requires vacuum that is deep enough to induce sublimation – movement of a solvent directly from the solid state (e.g., ice) to the vapor state. Effectively, since evaporative use of vacuum is directed at lowering the boiling point, for sublimation we are trying to achieve a boiling point that is below the freezing point (eutectic temperature). This takes much deeper vacuum than diaphragm pumps can reach. For these applications, rotary vane pumps are the most common choice. In the case of evaporative applications, it is very common for both heat and vacuum to be used to induce evaporation. As the warmed vapors pass through a length of vacuum tubing on the way to the pump, it is likely that they will cool enough that some condensation will occur in the lines. Where does that condensation go? Well, it moves to the pump. What happens when it gets there will determine the progress of your application. Liquids are not compressible and can impose mechanical forces that can damage your vacuum pump. Further, liquids inside a pump can be evaporated on the expansion stroke and condensed on the compression stroke, consuming a portion of the pumping capacity with every cycle, and impairing performance. If the pump has catchpots (also known as inlet separators), the liquids can be collected before they ever get to the pumping mechanism. This protects the pump mechanism from the forces introduced by the incompressible liquid. Pumps used with high vapor-load applications are best equipped with inlet separators. Along with the catchpots, it is important that the pump have an effective “gas ballast.” Vapors that reach the pump mechanism before condensing can be condensed in the pump on the compression stroke, causing similar problems as the already condensed liquids described above. Gas ballast, or a purge system, introduces air between pump stages to blow condensed vapors through the pump, mitigating mechanical wear and tear on the pump of internal condensation. Recall, however, that the reason you are using a vacuum pump is that you want to remove the air. What happens when you introduce air to remove condensable vapors? Some vacuum is lost. Depending on the design of a vacuum pump, the vacuum loss may be as little as 3-4 Torr, or as much as 12 Torr, with a corresponding loss of pumping speed near the ultimate vacuum. The difference may be enough to compromise your ability to reach the vapor pressure of the solvent you are evaporating, thereby dramatically slowing your process. Some manufacturers address this problem by providing an intermittent purge system. Intermittent purge introduces a periodic pulse of air instead of a continuous stream with the goal of achieving the desired vacuum conditions most of the time, interrupted by periodic pressure spikes from the purge air. When working with evaporative processes, make sure you ask your vacuum pump manufacturer if the pump has gas ballast, how it works (continuous or intermittent), and how much vacuum capacity is lost when the gas ballast is operating. If they can’t or won’t tell you, that should be a red flag. In contrast to rotary evaporators, concentrators are less likely to get condensation in the vacuum tubing because the vacuum is mainly what induces the evaporation. (The speed of the rotor can elevate internal temperatures in the concentrator to 35˚C.) So the considerations are the same with respect to the need for gas ballast and its impact on the available vacuum, while the inlet separators are most useful to protect the pump from particulates and droplets of liquids. Lyophilization creates different considerations, however, as the temperatures are so low as to require much deeper vacuum – typically in the range of 10-3 Torr – to induce sublimation. 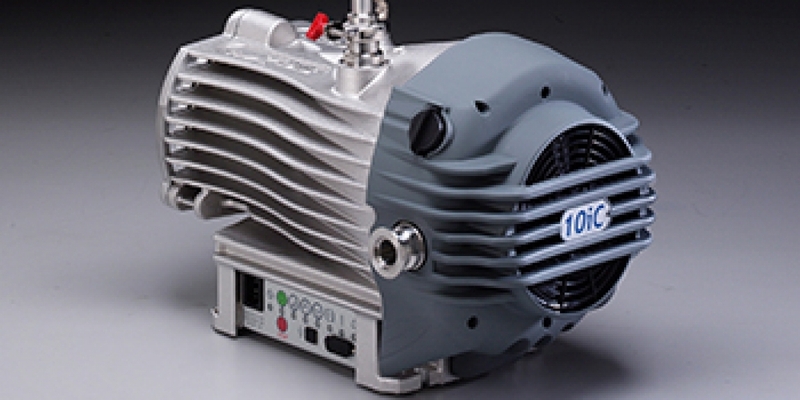 In this range, oil-sealed rotary vane pumps are the most common technology. With oil-sealed rotary vane pumps, the pump oil can become contaminated or degraded by the condensation of vapors in the oil. If the vapors are corrosive, the oil, which should be protecting the pump, becomes corrosive as well and can shorten the life of the pump if not changed very regularly. The correct operating temperatures for the solvents in use, along with careful process control, will be big factors in protecting the vacuum pump from vapors. One solution to the vapor challenge in lyophilization applications is the hybrid pump (or combination vacuum pump). These pumps combine a rotary vane section – which creates the deep vacuum needed – and a diaphragm pump which keeps the oil in the rotary vane pump under vacuum. The effect is to minimize condensation of solvent vapors in the pump oil, as well as to continuously distill out the vapors that do condense there. Not only does this prolong the life of the pump oil – extending oil change intervals by a factor of ten – but also pulls corrosive vapors out of the oil and reduces internal pump corrosion by a factor of about 50 when an application involves acid vapors. It’s worth noting that contaminated pump oil will corrode a pump whether it’s running or not, so keeping the oil clean is important even you don’t use the pump very often. One last consideration with oil-sealed pumps: make sure you have an oil mist filter on the exhaust. As air or vapors move through the pump, aerosols of oil can be created that be discharged into the workspace. Even if the pump exhaust is properly routed to a fume hood or exhaust duct, it is much better practice to capture that oil mist in a mist filter than deal with the mess or hazard. Because of the various challenges of working with oil-sealed pumps, many users have tried to employ oil-less technologies. As noted earlier, the physics of diaphragm pumps do not permit them to reach this depth of vacuum. Scroll pumps run dry, and thus eliminate oil changes, however it is important to check the compatibility of your solvents with a scroll pump to avoid expensive failures. Notice that this article has not addressed final drying and molecular distillation applications, nor pumps that serve as roughing pumps for turbomolecular pumps used in instrumentation vacuum. These tend not to be high vapor-flow applications. Similarly, filtration and aspiration applications often see high airflow but not vapor flow, as the vacuum used for these purposes should not be deep enough to generate copious vapor. In all of these cases, the most important concern is a pump that provides vacuum appropriate to the need. These simple steps can be taken to reduce the required time to freeze dry samples.